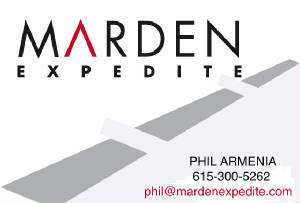 Marden Expedite, Inc. IS AN EXPERIENCED exclusive use, door-to-door Cargo Van expedited delivery company. Pick up and delivery - 24 hours a day, 7 days a week. Delivery to 48 states and Canada. Instant Tracking - G.P.S. "Real Time" satellite tracking technology. Insurance Coverage to meet and exceed all Regulatory Requirements. Owner Operators, Independent Contractors from Middle Tennessee to 48 States and Canada (passport required). Must have: RELIABLE CARGO VAN, SPRINTER, FORD TRANSIT (ONE TON PREFERRED). Call 615-778-9897 and leave message.